Okay Dolfans, you might have noticed that we didn’t update this site much during the off season but that doesn’t mean we aren’t working on a bunch of stuff in the mean time. There are enough Dolphins blogs out there that you don’t need our take on what’s going on, but as we get closer to week one I think it’s time for an update. We have a bunch of stuff going on this season so let’s go week by week. Our bar Slattery’s Midtown Pub IS showing the game. It’s the only nationally televised game and Dolfans NYC will be in the building, BUT there are events booked upstairs so it’s going to be more of a low key thing. Will be a fun time hanging out but not a real Dolfans NYC event. Game 4 of the preseason is always awful anyway. Dolfans NYC is supporting our Dolfan brothers to the south NOVA Dolfans who are throwing the “DC Shutdown” a similar event to our #MetLifeTakeover. They are doing a party the night before as well with our buddy Solo D performing. You can get tickets and find out more info here. Because of our support for the DC Shutdown event we are not going to be throwing a huge party at Slattery’s like we normally do on week one. That’s not to say Slattery’s won’t be packed but we won’t be doing any raffles or anything like that. And don’t worry DJ Tropic will still be DJing. THIS is the big Slattery’s kick off party! We are going to be doing a bunch of raffles all game and will have brand new Dolfans NYC merch for sale and maybe a few surprises. You should be at Slattery’s every week, but Week 2 is going to be a big one! This game starts at 9:30am! Slattery’s will be open at 8am and we will be doing breakfast. We will have bagels and coffee and I am sure some drink specials like Bloody Mary’s. Should be a really fun event. This is the second annual Fan Club Weekend in Miami. A huge crew of Dolfans NYC members are traveling to Miami for the game to meet up with fan clubs across the country (and world)! You can still get tickets to sit with us if you guys want to go. 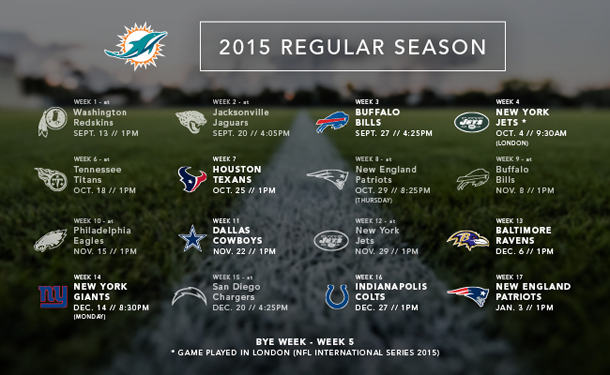 Just email dolfansnyc@gmail.com with the subject “Fan Club Weekend” for details! This is the big one! Our infamous #MetLifeTakeover! Last year we had 1200 Dolfans sitting together and I would love to see us beat that this year. We are doing a big catered tailgate with entertainment and food and it should be an amazing time. We are really blowing it up this year! Plus there will be a party at Slattery’s the night before. So get ready for a hell of a weekend! SIGN UP FOR THE TAKEOVER HERE!! This entry was posted on Friday, August 21st, 2015 at 8:03 pm	and is filed under Events, On The Road. You can follow any responses to this entry through the RSS 2.0 feed. Both comments and pings are currently closed. Are you guys not doing anything for the Philadelphia game? No, I don’t think so. Just too much going on this year. Sorry!